Election day fishing report. Stop by your polling place and cast a vote on the way to the river. If you are a Montana resident and support clean water and responsible mining, great day to vote yes on I-186. Visit https://www.yeson186.org/ to learn more. Snow day in Bozeman. Coming down pretty good, reports indicating several feet deep in the high mountains. What does this mean for anglers that aren’t ready to call it a season yet? Still lots of great fly fishing to be had in Bozeman, Montana. Fly fishing pressure is non-existent on our local rivers like the Madison River and Yellowstone River. Weather becomes the major variable that can hamper success on our rivers in November. Water temps are still great and the fish are on the feed. Float tips this past week on the Madison River were great. Calmer days with highs above freezing will be your best bet from here on out. Fish have started to move into deeper, slower water as temperatures have started to come down. Targeting them with nymphs and streamers will be your best bet from here on out. DePuy’s Spring Creek will be your best bet for dry fly fishing close to Bozeman, MT from here on out. The Missouri River and the Big Horn River will be your next best bets. Good midge hatches and lingering BWOs. Winter/Spring Special Guide Trips run from now until the end of April 2019. Good fly fishing at a great price. Give us a shout to book your Bozeman fly fishing trip today. The best float fishing option around for anglers fly fishing in Bozeman, MT this month. Flows are still above 1000CFS, water temperatures are great and lots of great trout on the feed. The trout on the Madison River have started to stack up in deeper, slower runs, and targeting these buckets with nymphs will produce consistent results. Our anglers and Bozeman fly fishing guides have had great luck in the past week with stonefly nymphs, worms, lightning bugs, midges, and larger caddis nymphs. Streamer fishing has also been excellent. Black, white, olive, and flashy have all been productive. Lots of lake fish have moved into the lower half of the upper Madison River. Great fly fishing for larger than your average rainbow trout and brown trout. We saw quite a few redds this past week, steer clear of these spawning areas, especially when wading. Streamer bite has been solid and nymphing has been good. The dry fly hatches are just about done for the year, but fly fishing with attractor flies will still yield some strikes. Great time of year to target the middle of the river. Nymphing 3.5-5ft deep on the current edges will be your best way to keep rods bent. The whitefish spawn is full on right now and they are feeding extremely aggressively. Enjoy catching whitefish, lots of fun in between trout. Our fly fishing guides generally nymph with larger attractor nymphs through November. Large stonefly patterns, buggers, crayfish, or princes are great top flies. Hare’s ears, princes, jig style flies, and lightning bugs are great second flies. Streamer fishing with smaller buggers has been productive and will continue to be all month long. Anglers hoping to catch the biggest and baddest of brown trout this month will want to throw big flies and cover lots of water. Big brown trout on the Yellowstone River never come easy. Just keeping casting. The ‘Mo continues to provide and will continue to do so all through the month of November. We are looking forward to our annual end of season Thanksgiving fly fishing trip that has previously been on the Big Horn River, but will be held on the Missouri River this year. Lots of fun, no matter what the weather decides to do. The upper Missouri River from Holter Dam to Craig will be the main attraction for visiting angler this month. The nymphing will continue to be outstanding. Czech nymphs, midges, sow bugs, smaller buggers, and larger attractor nymphs like worms and hare’s ears will all be on the table. Look for fish to move into slower water as water temperatures continue to drop. Having a hair trigger for setting the hook becomes very important. If your bobber so much as wiggles, set that hook. And don’t be surprised if it doesn’t take off running. For the dry fly anglers, opportunities will continue to present themselves all month long but it will not be an all day thing. A window here and a window there. Mostly midges with some lingering BWOs. If I was planning a November fly fishing trip to Montana, the Missouri River would be first on my list. From here on out probably the best overall option for anglers fly fishing in Bozeman, Montana. DePuy’s, Armstrong’s, and Nelson’s Spring Creeks will continue to fish well all month long. And the warming huts on DePuy’s Spring Creek are a great place to ride out winter weather. Midges will continue to hatch all month long. Calm wind helps a lot. Lots of fish in the creeks right now, and look for numbers to only increase through the winter into March. Nymphing has been outstanding with small midges #18-22 and sowbugs #16-20. Larger scuds have also been producing. Nymphing the runs below riffles in the morning and dry fly fishing after 11:30 AM has been a good program for all day success. 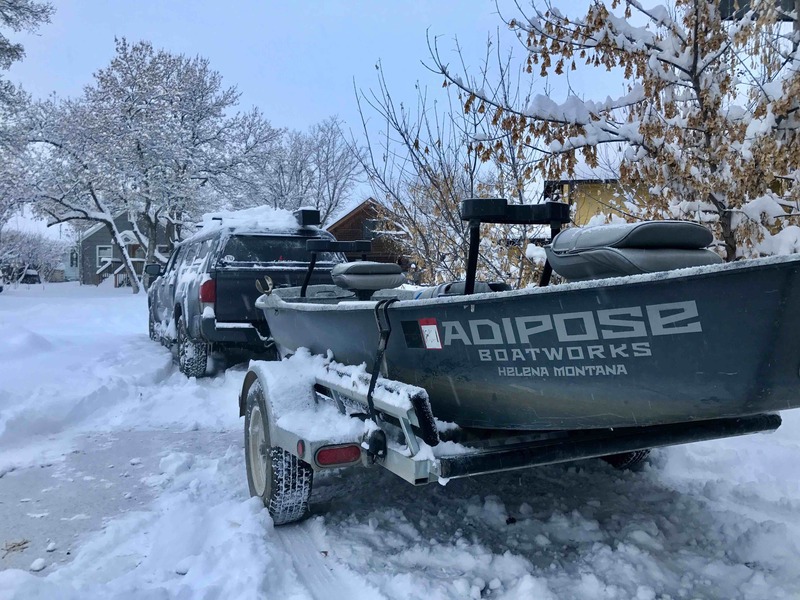 As it gets colder and days get shorter, proximity to Bozeman, MT becomes a major consideration for a day of fly fishing. And the Gallatin River sure is close. Nymphing with larger attractor nymphs including stoneflies, worms, larger hares ears, and princes will be great on the Gallatin River from here on out. No rod fees, lots of access, and consistently good fishing for wild trout make it a great option for all anglers in November. Probably where you will find our fly fishing guides fishing. Streamer fishing can also be great if you are willing to keep moving and covering water. Small, heavy buggers are your best bet.